The team won its first national championship after only five years in existence. Barth trains at a weekly team practice. 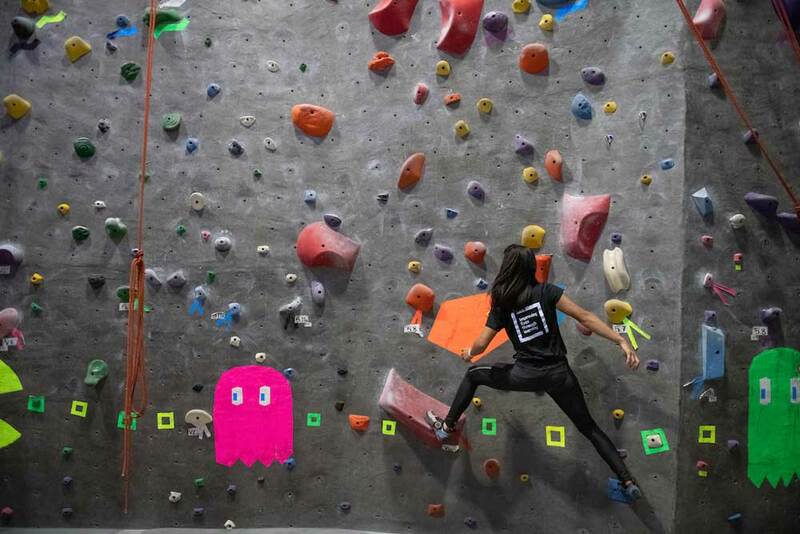 Like the Stanford indoor climbing team itself, Jenna Wang doesn’t take long to reach the top. The sophomore is a specialist in the sport’s speed event, in which competitors scale a nearly 50-foot wall with an explosion of power, pace and muscle memory. “If you relate climbing to running, speed is the hurdles,” says Wang, who can complete the sprint in less than 10 seconds. Her second-place finish at nationals in Houston this spring helped Stanford beat 90 other teams to claim its first national championship, only five years after the club’s founding. It’s not a minor mountain to conquer. 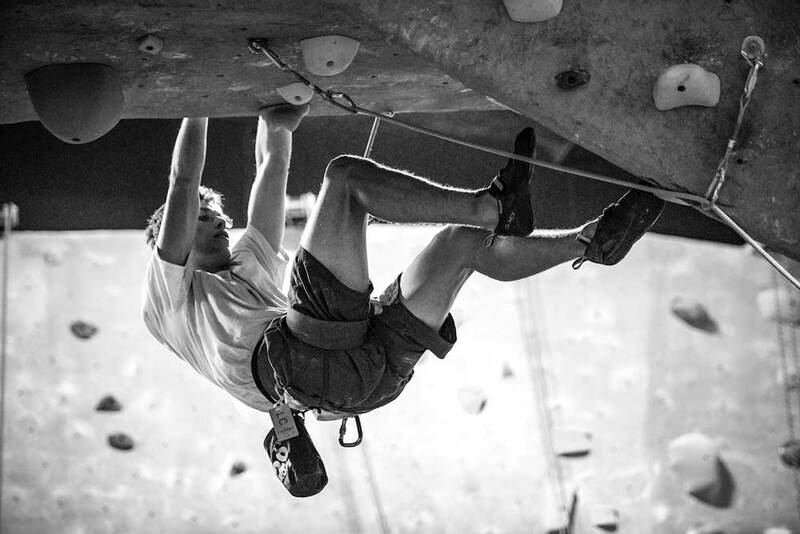 Buoyed by the ubiquity of climbing gyms, competitive climbing is on the ascent—the sport makes its Olympic debut in 2020. 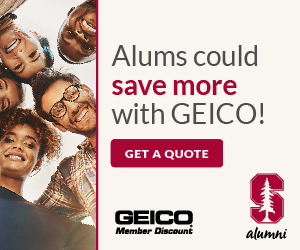 In its short existence, the 40-member Stanford team has gone from taking all comers to turning away far more students than it accepts. 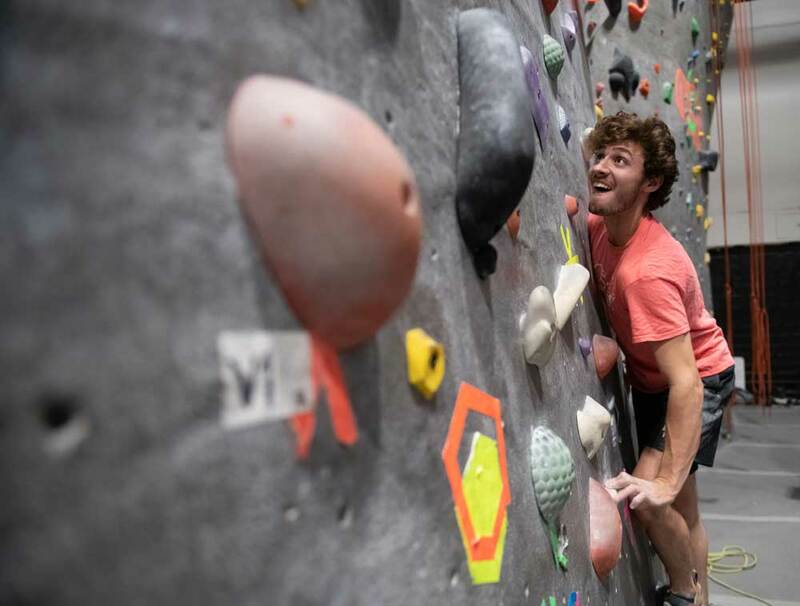 Its best climbers have been competing since early childhood, like Katie Lamb, ’20, the top Stanford woman at nationals, whose brother, Andrew Lamb, ’16, MS ’17, co-founded the club in 2013. Strength is obviously at the sport’s core. Wang’s friends know who to ask to open jars and even cleave apples with her hands. 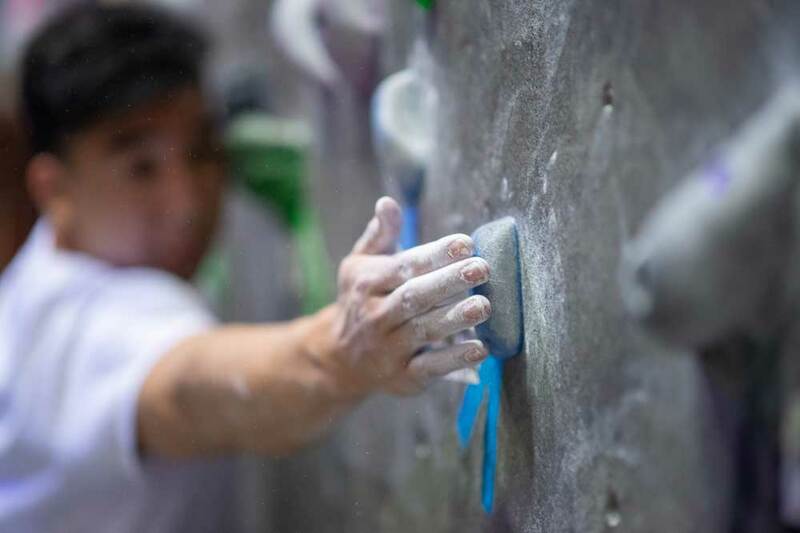 But competitive climbing also contains a strategic side, particularly in its other events: bouldering, which features shorter climbs without ropes, and sport, which involves roping up to ascend higher routes. 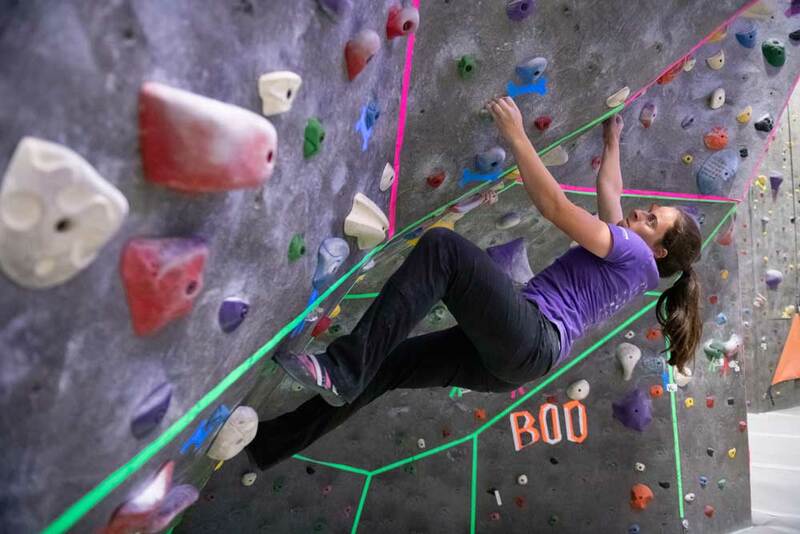 Unlike in the speed contest, competitors in these events only lay eyes on their climbs as they’re about to begin. And the ability to see the sequence through a “problem”—an arrangement of typically miserly hand- and footholds—can be crucial. The higher they go, the more points they earn. 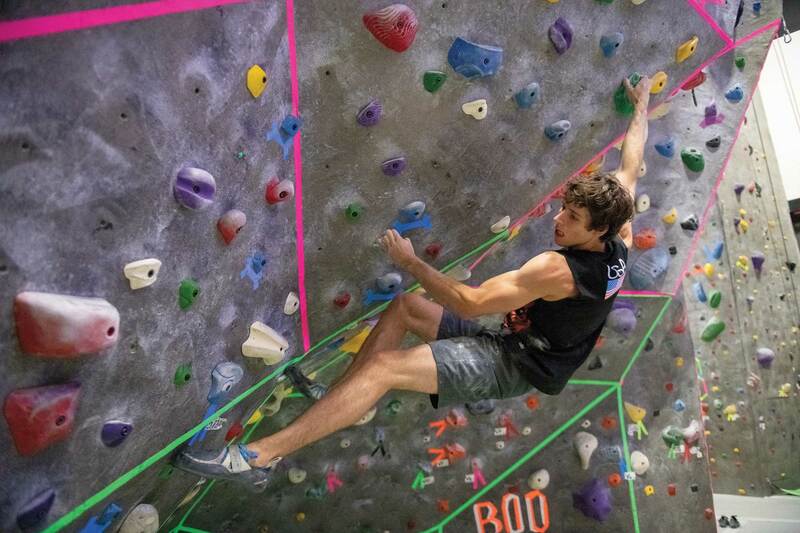 “Usually the best climbers are the ones who can intuit what the correct sequence is on the wall and who are strong enough to compensate for potential mistakes,” says Sol Barth, a senior who turned in the best all-around men’s performance at nationals. The outlook is good for 2019, he says. The best performers returned, and they’ve got an infusion of new talent in freshman Maya Madere, who deferred Stanford for a year to compete internationally. “She’s very, very strong,” Barth says. Two former Stanford stars weigh in.